Two local kids had an experience of a lifetime last Saturday night as their musical talents were rewarded in Magrath’s biggest musical competition. 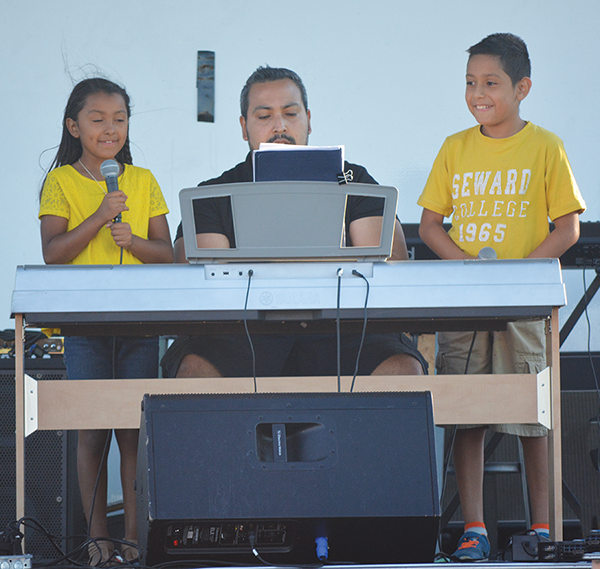 Eight year old Sophia and 11 year old Christopher Argueta took home $300 for winning the Magrath Talent Show during the final hours of Magrath Days. They performed Lost Boy by Ruth B. with their father on piano and were up against some tough competition, but were able to come out on top. “I was so happy we won and now we have money to go on a trip. It was a very happy time and my brother hugged me more than usual,” smiled Sophia. Christopher was feeling much of the same. “I am feeling extremely awesome. I saw my friend Emily pointing at me and then me and Sophia’s eyes got wide when we found out we won. We were totally surprised,” said Christopher. When asked what he would with the money, Christopher already had something in mind. It was a little bit different than what his sister was planning on doing with her half of the money. “My brother’s birthday is on August 4 so I am going to buy him some birthday gifts,” said Christopher. Their Father, Mario, said his children were a little hesitant on competing on such a big stage, but he is so happy they decided to participate. “It’s the best gift a father can have. I wanted them to start having a love for music like I do and this is going to be something they are going to remember their whole life,” said Mario. Music runs in the Argueta family and Mario is optimistic his children will carry on the tradition. “They have god given talent, but of course they need a little more motivation and will to do it. They love music and I am so happy for them,” said Mario. Organizer, Ryan O’Neill, was happy with the level of competition this year and is always surprised with the amount of talented people in this area. “This is the third time we have done this and each time we have different talent. It’s remarkable. It’s amazing to me that a small area like Southern Alberta can produce top quality talent,” said O’Neill. A lot of work went into this event and the help of the volunteers didn’t go unnoticed. “There’s no event without a ton of volunteers, but this is special. This takes a ton of hours and tons of people, one person can’t put this together. It’s amazing,” said O’Neill. O’Neill does similar events around Southern Alberta and says he is always impressed with the support they get from Magrath and the surrounding area. “This doesn’t happen anywhere else. You have the City of Lethbridge who does an event like Canada Day and you still don’t have this kind of gathering around a stage,” said O’Neill. The talent show was definitely the highlight of a fun filled day in Magrath and was later capped off with fireworks to end another year of Magrath Days.